Our deli containers are a great choice for packaging premade foods or even raw ingredients at your cafe, convenience store, or supermarket. Our selection of deli and food trays and lids covers a wide range of uses, from catering applications to cafeteria service and concession snacks. By stocking up on food service take-out containers, you can easily pack up food and drinks to go. We have the retail take-out containers you need for your merchandising area. Stock up on six pack carriers, cupcake containers, pizza trays, and more. Package fruits, salads, and other foods in these catering and to-go bowls. 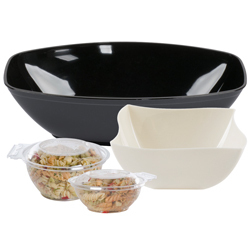 We offer plastic bowls in a variety of styles, many of which have lids. Use these souffle and portion cups to package the perfect amount of mustard, ketchup, salad dressing, or other condiments for your customers’ meals. From packaging leftovers to boxing up rotisserie chickens for customers to take home, we have the best selection of take-out and to-go containers for you. Stock up on the right style for your establishment, so you can always send your valued customers home with their food or beverage items properly packaged. For other great supplies for your business, be sure to check out our serving utensils, disposable table covers, and petite plastic dinnerware and accessories. 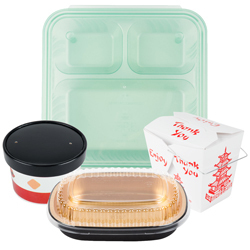 If you're wondering where to buy take-out containers and to-go boxes, we have a large selection of take-out containers and to-go boxes for sale at the lowest prices. Whether they’re taking home leftovers or purchasing food in disposable packaging, your customers need reliable food containers to maintain safe temperatures, prevent leaks, and keep food sanitary. By investing in take out food containers , you can diversify your services, menu, or display shelves to increase your profits. The selection of materials, types, and benefits are expansive, so it's important to select the right containers for your business's unique needs. Use this comprehensive guide to explore your options! They come in every shape and size! 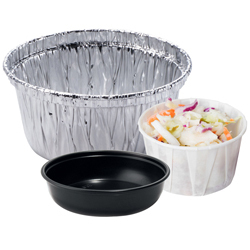 We have everything from corrugated cake boxes to tamper-evident deli containers. Hot or cold, we’ve got you covered! Choose from coffee carriers, foil containers, microwaveable buckets, and more. Go green! 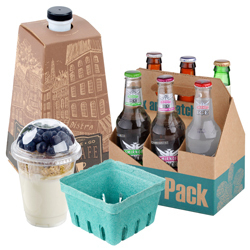 We carry eco-friendly cartons made from reusable, recyclable, biodegradable, and compostable materials. They’re customizable! Put your logo on our deli take-out cups and Dart foam bowls. 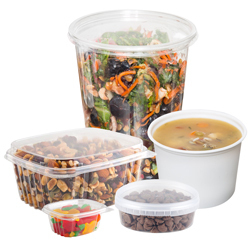 Disposable take-out containers are essential supplies in almost any foodservice establishment. We offer these products in every shape and size, so you'll have no trouble finding everything from large corrugated cake boxes to small tamper-evident deli containers. Whether you’re looking for to-go boxes for your fast food restaurant, cup carriers for your coffee shop, pizza boxes for your pizzeria, or deli trays for your catering business, we have you covered. 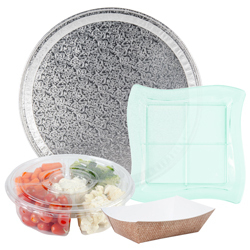 Our selection of disposable take-out containers includes items made from various materials, including plastic, foam, and paper. You'll also find eco-friendly options for your green establishment made of recyclable and compostable materials and microwavable products for convenient food re-heating. You'll also be able to choose from both hot and cold to go boxes, including coffee carriers, microwaveable buckets, and more. These to go containers and take out boxes enable kitchen staff members to package up foods for individual purchase, bulk retail, or catering applications. Many of these containers even come with their compatible lids, ensuring your salads, mixed greens, fruits, and other foods stay fresh and uncontaminated during transport or delivery. Best of all, some of these products can even be customized with your business's name or logo.